An image from "The Sandlot" trailer. Know what Hamilton "Ham" Porter is screaming in this scene? 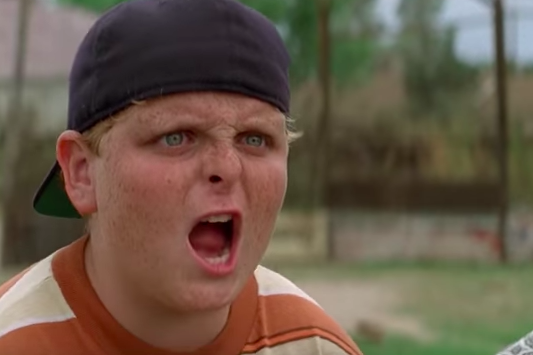 "The Sandlot," which came out in 1993, is celebrating its 25-year anniversary. The coming-of-age movie about baseball-obsessed kids in California’s San Fernando Valley has remained a steadfast favorite since it was first released, in part because it's endlessly quotable. "You're killing me, Smalls!" "Legends never die." "For-ev-er." Those are only a few. If you're a fan of Smalls, Benny, Ham, Squints and the rest of the team, keep Wednesday, June 13 open. PFS Roxy is hosting an evening screening of "The Sandlot" at 7:30 p.m.
Wednesday evenings are also BYOB nights at the Roxy, so go ahead and bring wine or beer to enjoy during the throwback pick.